Nonviolent direct action - a term which, in contemporary social movements, is usually used to refer to acts of civil disobedience, in which activists blockade or occupy public or private space - has become an increasingly common tactic of anti-coal climate activists since 2005. While Greenpeace has used direct action tactics since the 1970's, since 2004 other climate justice, Appalachian environmental justice and anti-mountaintop removal movements (such as Rising Tide, Rainforest Action Network, Earth First! Mountain Justice Summer, and indigenous groups) have used direct action tactics in order to escalate pressure on coal mining and power companies, financial institutions which invest in coal companies, and government officials that support the coal industry. Anti-coal activists have staged dozens of such direct actions in the past few years, many of which have been highly successful at directing public attention toward the growing anti-coal movement. The term "direct action" refers to political activities which attempt to bring about changes in the world in a direct and unmediated way. This concept of mediation is key to the distinction, drawn by many proponents of direct action, between direct and symbolic action: in a symbolic action, participants appeal to government officials or other power-holders to make changes on their behalf, while, in a direct action, participants directly make the changes that they want to see in the world. On September 24, 2008, former U.S. Vice President Al Gore told the Clinton Global Initiative conference in New York city, "If you're a young person looking at the future of this planet and looking at what is being done right now, and not done, I believe we have reached the stage where it is time for civil disobedience to prevent the construction of new coal plants that do not have carbon capture and sequestration." Mountain Justice Spring Break participants occupy the AMP-Ohio headquarters in Columbus, Ohio, on Mar. 28, 2008. On March 28, 2008, activists participating in Mountain Justice Spring Break occupied the lobby of American Municipal Power - Ohio's headquarters in Columbus, Ohio, and demanded a meeting with AMP's CEO Marc Gerken. Several people stated their intention to conduct a sit-in in the office if their demands weren't met; about 40 people protested outside. After 30 minutes, Gerken met with the protestors, and agreed to their demands: to schedule a meeting of the Board of Trustees at which community members could present their concerns with AMP-Ohio's proposed coal-fired power plant in Meigs County, Ohio. No arrests were made. On April 1, 2008, as part of the Fossil Fools International Day of Action, a group of North Carolina activists with Rising Tide and Earth First! locked themselves to bulldozers to prevent the construction of the Cliffside coal-fired power plant proposed by Dominion in western North Carolina. Others roped off the site with "Global Warming Crime Scene" tape, and held banners protesting the construction of the plant. Police used pain compliance holds and tasers to force the activists to unlock themselves from the construction equipment. Eight people were arrested. One of the blockaders of a Citibank NYC headquarters is arrested. On April 1, 2008, as part of the Fossil Fools International Day of Action, 25 "billionaires for coal" blockaded Citibank's Upper West Side headquarters in New York City. Two people chained themselves to the door, while others - dressed in tuxedos and top hats - drew attention to Citi's funding of new coal power plant development and mountaintop removal mining. Police cut through the chains locking the two billionaires to Citibank's door, and arrested them. On April 1, 2008, as part of the Fossil Fools International Day of Action, four activists used lockboxes to block the entrance to a Bank of America branch in Boston, in protest of BofA's investments in coal mountaintop removal mining and new coal power plant development. Others held banners and signs in support of the action, which was organized by Rising Tide North America and Rainforest Action Network. Police used saws to cut through the lockboxes, and arrested the four blockaders. 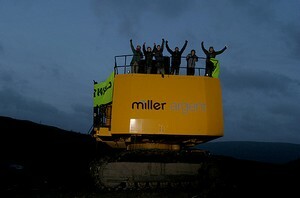 Activists occupy construction machinery at the Ffos-y-Fran coal mine construction site in South Wales on April 1, 2008. On April 1, 2008, as part of the Fossil Fools International Day of Action, dozens of local residents and activists from a variety of environmental groups occupied the Ffos-y-fran coal mine construction site in South Wales. Protestors arrived at 6 am, scaled a coal washery and dropped a 100-foot banner, took over construction machinery, and locked themselves to the front gate, shutting down major work at the site for the day. Police made two arrests, and the other activists left without incident. Eastside Climate Action activists blockade E.ON's headquarters in Nottingham on April 1, 2008. 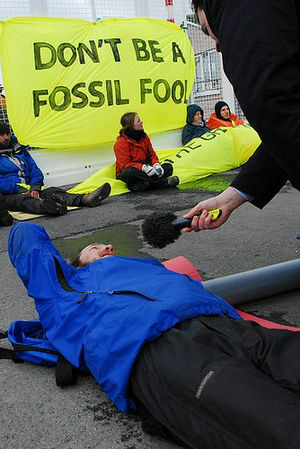 On April 1, 2008, as part of the Fossil Fools International Day of Action, 30 activists with Eastside Climate Action blockaded the front entrance of E.ON UK's headquarters in Nottingham, England. Two people used U-locks to lock themselves to the front door, while others blockaded the back entrance; other protestors poured green paint on themselves, to simulate E.ON's "greenwashing". 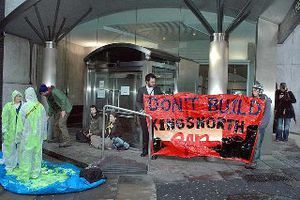 The action was in protest of E.ON's plans to build the Kingsnorth coal-fired power plant - the first new coal plant in the UK in 50 years. Police made two arrests, and the building was shut down for the day. Activists blockade the front gates of the Aberthaw power station in South Wales on April 3, 2008. On April 3, 2008, as part of the Fossil Fools International Day of Action, members of Bristol Rising Tide occupied the Aberthaw coal-fired power plant, operated by RWE npower in South Wales. Activists entered the facility, chained themselves to conveyor belts, and occupied several buildings; others locked themselves to the facility's front gates. The action was in solidarity with the Ffos-y-Fran mine construction site in South Wales; coal from Ffos-y-Fran will be used to fuel Aberthaw for 17 years. Police arrested 11 people. Blue Ridge Earth First! blockade Dominion Power's headquarters April 15, 2008. On the morning of June 13, 2008, 40 Camp for Climate Action activists, a small number disguised as railway workers, flagged down and stopped a coal train on its way to Drax Power Station, the UK's largest power plant. Protesters climbed onto the train and unloaded almost 20 tons of coal onto the tracks while others chained themselves to the train. A banner was unfurled reading 'Leave it in the Ground!'. Riot police stormed the train and removed the protesters around midnight. 29 were arrested. Protesters rallied outside while two campaigners infiltrated a major coal conference in Brisbane, Australia, calling for more Queensland Government support for renewable energy. Once inside, the the two activists took the floor and addressed the Queensland Coal08 conference, which was held to discuss the future of the coal mining industry in the largest coal exporting state in the largest coal exporting country in the world.. No arrests were made. Blue Ridge Earth First! and Mountain Justice blockades Dominion's headquarters to protest planned coal-fired power plant in SW Virginia. June 30, 2008. On June 30, 2008, 20 Activists with Blue Ridge Earth First! and Mountain Justice Summer blockaded the entrance to Dominion Resources' corporate headquarters to protest the company's plan for the new coal-fired Wise County Plant in Southwest Virginia. Four protesters formed a human chain with their hands encased in containers of hardened cement and a fifth dangled by a climber's harness from the Lee Bridge footbridge. After several hours police made their way through the miles of backed up traffic to cut the activists out of the lockboxes and barrels. The climber came down on his own. Police also detained eight others standing on the sidewalks supporting the lockdown team. 13 in total were arrested..
At dawn on July 3, 2008, 27 Greenpeace activists entered the 2,640 megawatts Eraring Power Station site north of Sydney to call for an energy revolution take direct action to stop coal from being burnt. 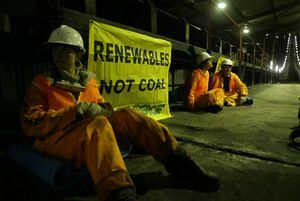 Twelve protesters shut down and chained themselves to conveyors while others climbed onto the roof to paint 'Revolution' and unfurled a banner reading 'Energy Revolution - Renewables Not Coal'. The action preceeded the Australian government's climate change advisor Professor Ross Garnaut's delivery of his Draft Climate Change Review on July 4. Police arrested 27..
On July 7, 2008, approximately 75 Earth First! activists gathered outside American Municipal Power (AMP) headquarters in Columbus, Ohio to protest the company's plan to build the new 960 MW coal-fired American Municipal Power Generating Station in Meigs County, Ohio. Two protesters climbed flag poles in front of the building and hoisted banners that read “No New Coal!” and “We won’t stop until you do”. Around 20 activists entered the building and occupied the lobby as five protesters connected themselves to each other using lockboxes. Police used pepper-spray on the protesters and arrested eight when they refused to leave. On July 10, 2008, nearly fifty Mountain Justice Summer activists gathered in opposition to a coal project in Massachusetts, donning haz-mat suits and delivering a pile of coal while displaying "global warming crime scene" caution tape on the front steps of the Office of Energy and Environmental Affairs in Boston. The action was in response to the office dismissing an appeal of the state's approval for a coal gasification project in Somerset, MA. On July 11, 2008, four Greenpeace activists climbed the 462 foot high smokestack of the coal-fired Swanbank power station near Brisbane, in Queensland, Australia. While the smokestack climbers hung a 'Renewables Not Coal' banner, two other activists climbed onto the roof of the plant and unfurled a banner reading 'Energy [R]evolution'. The four remained on the smokestack overnight in near freezing temperatures. On July 12, one of the protesters painted 'Go Solar' in huge lettering down the side of the smokestack. After 33 hours of occupation, all four climbers descended voluntarily. The goal of the action was to raise the level of debate in Queensland and the rest of Australia, re-emphasize the urgency of the climate change issue and the need to start shifting from coal to renewables. On July 13, 2008 approximately 1000 activists stopped three trains bound for export at the Carrington coal terminal for almost six hours. Dozens of protesters were able to board and chain themselves to the trains while others lay across the tracks. Hundreds were held back by mounted police. Police arrested 57. On July 16, 2008, activists with Oxford Climate Action blockaded the headquarters of public relations giant Edelman Public Relations. Several protestors gained access to the firms offices while others climbed onto the roof to unfurl a banner reading "Edelman: Spinning The Climate Out Of Control". Edelman PR was hired by E.On, the world’s largest investor-owned energy service provider. E.ON UK is proposing to upgrade its coal-fired Kingsnorth Power Station to use supercritical coal technology. Kingsnorth is currently considered to be a conventional coal plant but under the EU’s Large Combustion Plant Directive, the plant would eventually have to be closed without the upgrade. According to activists, Edelman PR is engaging in a campaign to 'greenwash' E.On's continued investment in burning coal. On August 11, 2008, nine activists glued themselves to the revolving door and windows at BHP Billiton's headquarters in central London. The protesters also scattered coal across the floor of the lobby. BHP is one of the world's largest coal companies. According to one activist the protest was to highlight that the "expansion of the coal industry is unacceptable in the face of impending climate chaos." The protest ended peacefully after 90 minutes and there were no arrests. Activists board one of the world's largest coal platforms at Botas Oil Terminal, stopping barges from importing coal to the Sugozu (Isken) coal fired power plant. In September 2008, four climbers from Greenpeace's Rainbow Warrior were arrested after they occupied a giant coal loading platform to prevent a delivery of coal to the Sugozu power station, which emits 10 million tonnes of carbon dioxide annually. 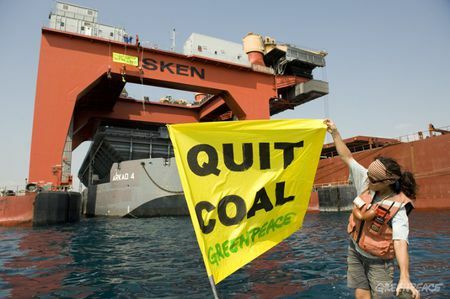 On September 9, 2008, two Greenpeace activists painted “Quit Coal” in English and Hebrew on the hull of a ship unloading coal at the Ashkelon power plant. The activists are calling on the Israeli government to abandon its plan to build a new coal power plant in Ashkelon. Police with support from the Israeli Navy arrested the captain, crew and passengers of the Rainbow Warrior. 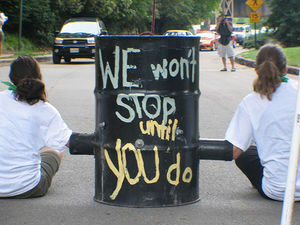 On September 15, 2008, protesters locked their bodies to steel drums at the construction site of Dominion Virginia's new coal-fired power plant in Wise County, VA. Early morning on September 15, 2008 around 50 peaceful protesters entered the construction site of Dominion Virginia's coal-fired Wise County Plant. 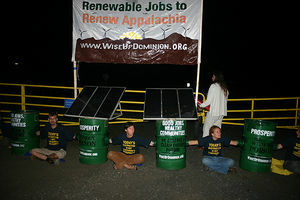 Twenty protesters locked their bodies to eight large steel drums, two of which have operational solar panels affixed to the top that illuminated a banner reading "renewable jobs to renew Appalachia." In addition to those locked to the construction site, over 25 protesters from across the country convened in front of the plant singing and holding a 10'x30' banner, which said "we demand a clean energy future." Eleven were arrested. Students, community groups, and activists held a public rally outside Bank of America's Harvard Square branch, protesting both Bank of America's and Citi's risky investment strategies, which have contributed to the current economic crisis and are jeopardizing the global climate. The demonstrators then marched to a nearby Citi branch, where four activists wearing t-shirts reading "Not with Our Money" locked themselves to the entrance. 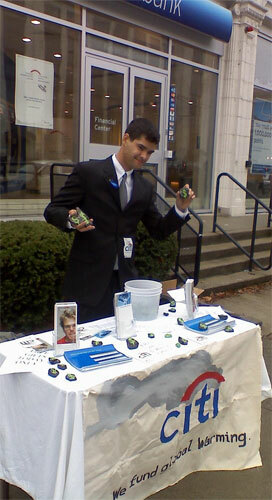 Rising Tide Boston hands out samples of "green coal" at Citibank and Bank of America. Students, community groups, and activists held a public rally outside Bank of America's Harvard Square branch, protesting both Bank of America's and Citi's risky investment strategies, which have contributed to the current economic crisis and are jeopardizing the global climate. The demonstrators then marched to a nearby Citi branch, where four activists wearing t-shirts reading "Not with Our Money" locked themselves to the entrance. The protest was organized by Rising Tide Boston and City Life Vida Urbana. On October 18, 2008, citizens from across the state of Arkansas rallied at the state capitol building in Little Rock to protest the proposal of two new coal-fired power plants in the state. The protesters asked for investment in wind energy and a ban on new coal plants. Zombies descend on Bank of America in Boston's Copley Square on Oct. 31, 2008. On Halloween, zombies descended on Copley Square to visit local Bank of America and Citibank branches to protest their funding for new coal power plants. The action was organized by Rising Tide Boston. Similar events were held in North Carolina and California. 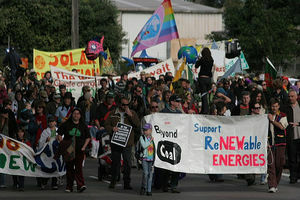 Thousands of activists around the United States mobilized to protest coal mining, coal-fueled power plants, and coal financiers. The grassroots groups involved in the action included Rainforest Action Network, Greenpeace, Rising Tide North America, Mountain Justice, Student Environmental Action Coalition (SEAC), Coal River Mountain Watch, Ohio Valley Environmental Coalition, Southern Energy Network, and Earth First. Activists placed anti-coal banners in strategic locations across the country, protested at Bank of America and Citibank branches and shut down ATMs shut with crime scene tape, and infiltrated Bank of America's Energy Conference. As part of the National Coal Finance Day of Action, members of Rising Tide Boston set up outside Bank of America and Citibank branches to highlight the primary role these banks play in financing in coal power and mining. The activists handed out samples of "green coal" to imitate the coal industry's marketing pitch of "Clean Coal." According to one activist's pitch, "Although we’ve spent a lot of time and resources researching ways to make coal environmentally friendly, or ‘clean and green’, the best way we found to do it is to paint it green." Student activists gathered outside Johnsonville High School during a public hearing to protest the proposed Pee Dee Generating Facility. Sponsored by Santee Cooper, the project would include two 600MW pulverized coal-fired power plants along the Great Pee Dee River in Florence County, South Carolina. The activists brought with them a black inflatable coal plant similar to a jump castle, with a sign saying "CLEAN UP DIRTY COAL PLANTS NOW." The public hearing concerned water quality. Santee Cooper's environmental impact study for the plant acknowledged that despite the utility's best efforts, some toxic materials will end up in the river. About two dozen Greenpeace activists protested at a new opencast mine, waving "Quit coal!" banners and clashing with miners. The incident drew attention to the upcoming COP14 conference on climate change. The city of Poznan will be the site of the UN-led conference, which is aimed at creating a new global climate agreement to replace the Kyoto protocol, which expires in 2012. Poland relies on coal to generate more than 90 percent of its energy needs. In full view of security cameras, a single activist climbed two 10-foot, razor-wired and electrified security fences at E.ON's coal-fired power plant and crashed a huge 500MW turbine, leaving behind a banner that read "no new coal." All power from the plant was down for four hours, which cut the UK's CO2 emissions by an estimated 2 percent. Police are still searching for the activist. Greenpeace activists blocked the ship Hanjin Imabari, carrying coal from South Africa to the Danish coal plant Enstedvaerkey, in Aabenraa. The aim of the protest, according to a Greenpeace spokesman, was to increase the pressure on European Union negotiators meeting in Poznan, Poland, to take serious action on climate change. With help from United Mountain Defense and Three Rivers Earth First! Santa and elves came armed with coal and switches for the largest purchaser of coal in North America: TVA. Santa read letters from sad children who could not go outside and play sometimes because of days where it is literally unhealthy to breathe in Knoxville, letters from children sad that too many of their grandparents die slow deaths of extended asphyxiation while lugging around bottled oxygen, and letters from children complaining that mountains are being blown up to get at that coal. The children said they felt that the drinking water was important and that they liked playing in the forest. After being asked to leave the premises, the North Pole-based environmental group proceeded outside to sing anti-coal carols and hand out information sheets. On Decemer 11, while attempting again to deliver letters from sad children, Santa was detained by the TVA police for an hour and half and issued a warning citation for supposedly disrupting a board meeting which had officially ended. The arresting TVA officer became concerned when he discovered that Santa had switches concealed in his britches. Santa was released after being detained without milk and cookies. Santa told reporters: “I am depending on all the little activist elves to deliver more coal to federal agencies in hopes to influence the first 100 days of president-elect Obama's administration through the newly appointed agency heads. This new administration must make stopping strip mining and addressing the destructive impact of coal on Santa’s children its first priority. Ho Ho Ho.”  At 4 p.m. on December 12, while Santa and his elves were dancing and singing, TVA sent out one of its head PR people, Gill Francis. Mr. Francis wanted to meet and negotiate with Santa but Santa was too busy and took a number. After finishing the dance, Santa had his head elf call Mr. Francis to come back out and negotiate. When Mr. Francis appeared slightly out of breath Santa said he was sorry and put coal and switches in Mr. Francis hands saying, "This is the least favorite part of my job Mr. Francis--but TVA has been veerrrrry naughty." As Mr. Francis stormed off Santa and his elves resumed dancing. ↑ Mountain Justice Summer, Previous Actions, April 2008. ↑ What is Direct Action?. Infoshop website, accessed January 2008. ↑ "Mountain Justice Takes On King Coal in Columbus", WattHead blog, Mar. 28, 2008. ↑ "Eight Climate Protesters Arrested at U.S. Coal Plant", Reuters, April 1, 2008. 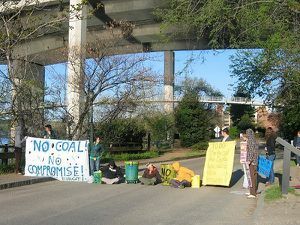 ↑ "Eight Arrested as North Carolina Residents Shut Down Construction at Cliffside Coal Plant", Fossil Fools Day blog, April 1, 2008. 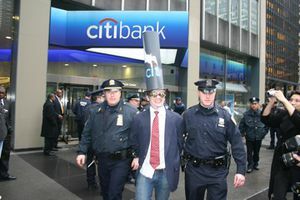 ↑ "Billionaires for Dirty Energy Blockade Citibank in New York, Two Arrested", Fossil Fools Day blog, April 1, 2008. ↑ "Making a Stand", Merthyr Express, April 3, 2008. ↑ "Protestors Shut Down Open-Cast Mine in Wales, Two Arrests", Fossil Fools Day blog, April 1, 2008. ↑ "Climate Protest in City Centre", Nottingham Evening Post, April 1, 2008. ↑ "Eastside Climate Action Blockade E-ON Workers As Part of Fossil Fools Day", UK Indymedia, April 1, 2008. ↑ "Aberthaw Power Station Successfully Blockaded This Morning", UK Indymedia, April 3, 2008. ↑ "Direct Action Double Whammy Against Welsh Carbon Dinosaurs", Luther ap Blissett blog, April 6, 2008. ↑ "3 arrested in protest near Dominion office", Richmond Times Dispatch, April 15, 2008. ↑ "We Shut Down a Major Corporation On an Hour of Sleep and So Can You! ", Blue Ridge Earth First!, April 15, 2008. ↑ "Coal train ambushed near power station in climate change protest", The Guardian, June 14, 2008. ↑ "Police arrest 29 coal train protesters", Reuters UK, June 14, 2008. ↑ "Women Climb Flagpole In Power Plant Protest", NBC 4 Columbus, July 7, 2008. ↑ "Police arrest protesters at Ohio power company", WDTN 2 Dayton, July 8, 2008. ↑ "Zombie March on Coal’s Top Investorts, Copley Square, Boston," Ian MacLellan's Photo Blog, October 31, 2008. ↑ "Young activists fired up in fight against coal," Post and Courier, November 19, 2008. ↑ "Utility's plan stirs coal-ash debate: Some say new Santee Cooper plant on Great Pee Dee River will bring toxic pollution despite safeguards," Post and Courier, October 28, 2008. ↑ Polish Miners, Greens Clash On Eve Of Climate Talks, Planet Ark, November 25, 2008. ↑  Oldest power station ‘must be closed’ Central Coast Express Advocate. ↑ "No new coal - the calling card of the 'green Banksy' who breached fortress Kingsnorth," The Guardian, December 11, 2008. ↑ "Santa Protest TVA Dec 5th," Youtube, accessed September 2009. ↑ "TVA arrests Santa Claus Dec 11 2008," Youtube, accessed September 2009. This page was last edited on 16 May 2013, at 22:49.